This is a complete energy treatment in an essence combination. It is interactive & can be used for any reason--physical, mental,emotional, spiritual--for any reason one might have an energy treatment. One sets the intention for use -- then takes 1 to 5 drops for immediate support for 2 – 3 times a day — or more often if needed (trust your Guidance). One can take 10 -15 drops or more (trust your Guidance on amount) for a full treatment when one has at least 30 minutes before having to be active & alert or one can take it at bedtime for a treatment or to promote deep restful sleep. It is wonderful for dropping into a meditative brain wave for actual meditation or before doing energy treatments as well. It is great for general relaxation, pain relief, & for increased energy, vitality, & strength & overall healing depending on what one needs at the time of taking it. 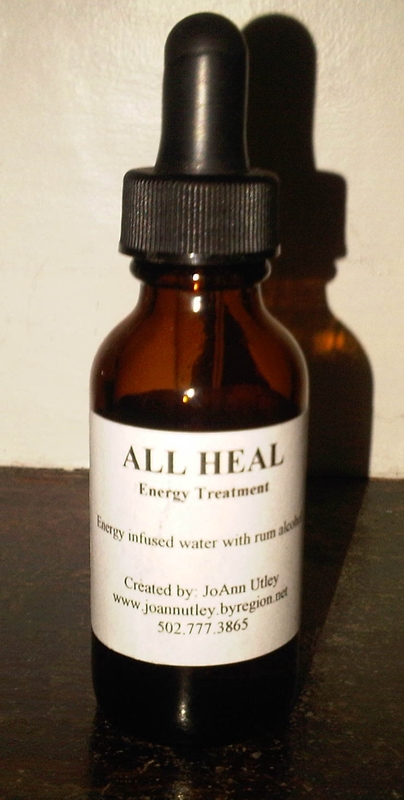 All Heal contains the 4 Usui Reiki symbol frequencies, 2 Tibetan Reiki symbol frequencies & all 12 Karuna Reiki symbol frequencies, Reconnective Energy, Switchwords, an Energy Clearing Prayer, a Centering Prayer, all of the BioGenesis Tools, Wheels & Rings with Sacred Geometry in the BioGenesis Wing Water treated to remove toxins & energize with the Earth’s grounding energy. Shipping costs will be added to cost of item.